Quentin Tarantino’s classic Kill Bill movies proved that you shouldn’t mess with a woman with access to a sword. Beatrix Kiddo aka The Bride is the star of this fan adaptation of Kill Bill Vol.1, a scrolling beat’em up that recreates the most important parts in the movie. 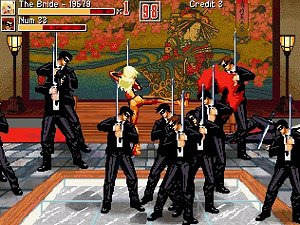 Kill Bill Vol.1 features recognizable sprites and some excerpts from the film’s soundtrack, but the quality pales in comparison to most recent games and it stands mostly as a piece of entertainment for fans of the movies.